Just one subject for my weeknotes post today. 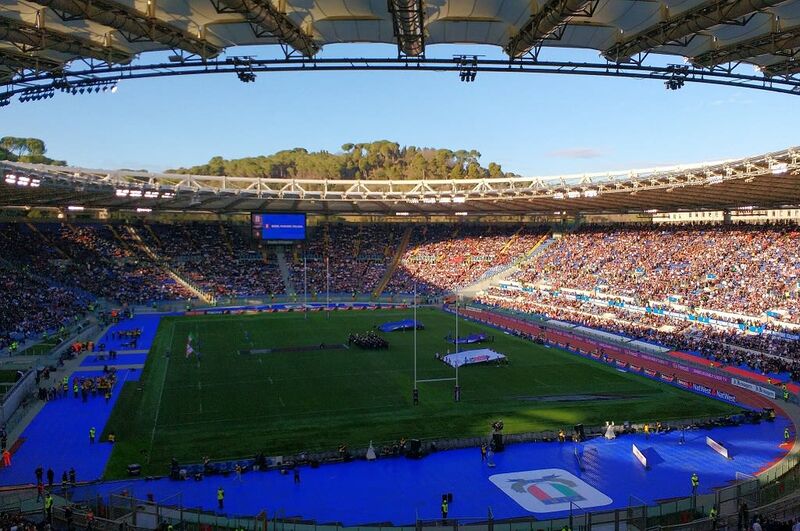 A trip to Italy last weekend to meet with friends and watch Italy v England in the rugby Six Nations Championship. It’s a trip I make every two years because that’s when England play in Rome. Friday: 5.00am taxi to Gatwick, 7.05am flight Gatwick → Naples, drive to Fumone. Saturday: Chill-out day in Fumone. Sunday: 11.30am, drive to Rome for lunch and the game (4pm KO). Return to Fumone. We flew to Naples because we were heading for a small, old Italian village called Fumone which is between Rome and Naples. It’s actually closer to Rome but Naples airport is easy to get through and it’s a quick exit to the motorway. Rome traffic is altogether a different experience! Pope Celestine V was imprisoned in Fumone. We stayed in a friend’s sister’s Bed and Breakfast called Antico Borgo (reviews here) which is in the car-free centre of Fumone. It’s a unique and charming place to stay with small rooms but with big hospitality from Lisa, our host, and her Italian family and friends. Villages like Fumone probably exist all over Italy but there’s nothing quite like it in the UK. Yes, we have old villages, but Fumone is perched on a hill with a village centre that consists of narrow cobbled streets next to old houses. Cars cannot drive into the centre and only a few hundred people live there. It feels a bit like nothing has changed since medieval times. Valter’s Pizzeria: All the pizza you can eat for a remarkable price. Bar Del Castello: A friendly welcome from Sergio and his wife. La Taverna del Barone: Eat upstairs in a medieval-style gallery. Hearty food and local music. On the Sunday, we drove to Rome, parked the cars and met other friends for lunch before the game. We’d pre-booked the restaurant and there were about 20 of us there. Along with many other England fans. The restaurant was a sea of white shirts! It’s always a great atmosphere in Stadio Olimpico. Both sets of fans are sitting together and there’s never any trouble. There are blue Italian shirts, white England shirts, and a large number of England fans in Crusader costumes with St George crosses. The Italian national anthem sets the tone before the kick-off, it’s very upbeat - whereas God Save the Queen is stirring but not very exciting. Oh well. The game was open and attacking and there were nine tries. Both teams played well but England are the stronger team and this was especially evident in the last 15 minutes. England won 46-15. Italy have never beaten England but the Italian fans are very sporting. They cheer and shout at the start of the game and for any Italian try or attacking move. Yet, at the end of the game, they must be very deflated. But, they are still gracious in defeat. I admire that. After the game, we drove back to Fumone ready for the flight home the next day. That was the only downside of this weekend, a short evening after the game and an early start the next day for drive to Naples and return flight. All in all, this was another fantastic rugby trip. I will be returning in two years, I’m sure. Aha thats where you were! We were to your right on the corner - the other side of the mad Italian band! I did think you might be over there. Yes, the band are there every year!